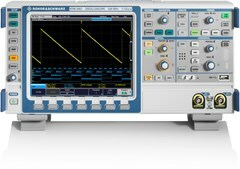 With the introduction of the RTC1000, RTM3000 and RTA4000 in 2018, Rohde & Schwarz offers a completely renewed oscilloscope portfolio. The oscilloscopes convince with their excellent features and the intuitive operation, which makes the use even more comfortable. The appealing user interface from the RTB2000 up to the RTA4000 model series enables best comparability and a secure Operation of various models. A variety of applications is possible by covering a bandwidth of 50 MHz up to 1 GHz. The RTC1000 combines the functionality of an oscilloscope, logic analyzer, protocol analyzer, frequency counter, pattern generator, function generator, digital voltmeter and component tester at an affordable price in a single device. 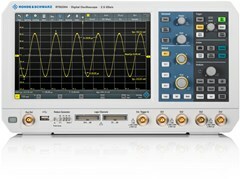 The triple "Power of Ten" 10-bit-A/D-converter, 10 Msample memory and 10.1 "touch screen - in combination with intelligent operating concepts makes the RTB2000 digital oscilloscope the perfect tool for university laboratories, the troubleshooting in embedded designs and for production and service departments. The high resolution of 1280x800 pixels of the touch display ensures a razor-sharp and detailed display of the signals. Compared to the already outstanding RTB2000, the RTM3000 offers a further improved input section with extremely low noise, a resolution of 500 uV/DIV, a four times greater memory depth, a complete spectrum analysis option, extensive math functions and the Rohde & Schwarz "Probe Interface". The RTA4000 offers the maximum performance in all areas. The extremely low input noise, the time accuracy and the memory depth set standards. 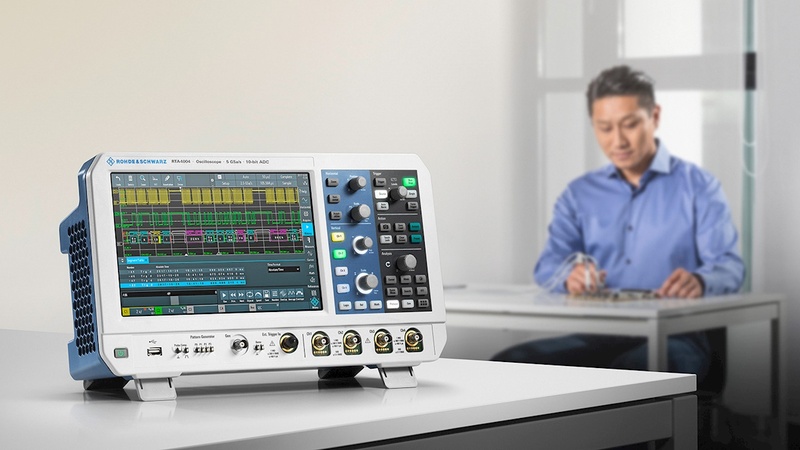 High sensitivity, multi-functionality and a good price - this is what characterizes the digital oscilloscopes of the R&S® HMO1002 and R&S® HMO1202 series. The HMO1000 series has been replaced by the new RTC1000 series. The 2- and 4-channel instruments provide bandwidths of 300, 400 and 500 MHz, a sampling rate of 4 GSa/s and a memory depth of 8 MPts. The instruments are rounded off with a standard inclusion of the MSO functionality and several options for serial bus analysis to meet all requirements of modern development designs. The HMO3000 series has been replaced by the new RTB2000 / RTM3000 series. 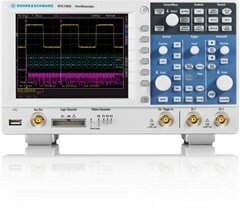 Ease of use combined with fast and reliable results is precisely what users get with the R&S®RTM bench oscilloscope. While other oscilloscopes are still booting up the R&S®RTM is already displaying signals, that would otherwise be lost in the noise, and evaluating results. The RTM2000 series has been replaced by the new RTM3000 series.